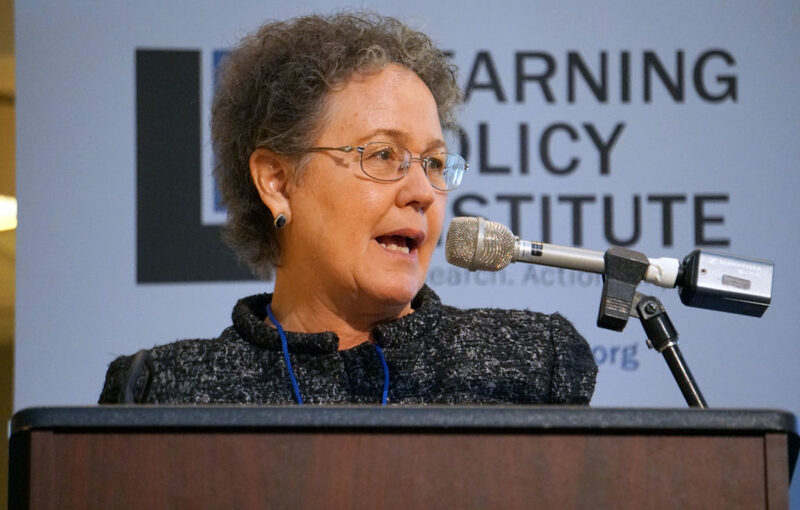 Linda Darling-Hammond speaks at Learning Policy Institute/EdSource conference in Sacramento on Feb. 21, 2019. In another sign of the changing of the guard in the leadership of education policy in California, former Stanford professor and leading researcher Linda Darling-Hammond was selected to be president of California’s State Board of Education by fellow board members on Thursday, a month after Gov. Gavin Newsom named her to the post. Before being selected president, she was sworn in as a board member by State Superintendent of Public Instruction Tony Thurmond who is a non-voting member of the board with the official title of executive secretary. Thurmond was elected to his statewide position last November. Ilene Straus, a former educator in the Beverly Hills Unified School District, was re-elected vice-president to the board which meets approximately every two months. Before being named to the board, Darling-Hammond had served for six years as chair of the California Commission on Teacher Credentialing. She was appointed to that position by former Gov. Jerry Brown. Newsom has yet to name a replacement to that post, which like the president of the State Board, is essentially an unpaid position. Darling-Hammond succeeds the former president Michael Kirst, another Stanford professor emeritus who served on the board for an unprecedented 16 years — during Brown’s four terms as governor beginning in the 1970s and then from 2011 on when Brown was elected governor again. Because California governors can no longer serve for more than two terms, it is unlikely that Kirst’s longevity on the board will ever be matched. Kirst said last month that Darling-Hammond’s expertise in teaching and learning will bring an important perspective to the board. “She brings new strengths in a state where we have to strengthen instruction for such a diverse student body,” he said. Keep charter schools out of public education Congratulations!! Congrats Ms.Darling-Hammond. I hope there will be changes in the teacher testing department (RICA) that hinders many teachers to apply for their credential and pay student loans and feed their families. With the SAT scandal, it leaves me wondering if RICA test is just put there to hinder citizens from doing what they like (teach kids) and better their tomorrow. It breaks my heart to see how the teaching business has been made a money making business at the cost of those are called to teach and kids cramped in classes. Please do something for the sake of tomorrow’s leaders (children).